Brief, practical, and affordable, The Art and Craft of Fiction gives aspiring writers all they need, in a friendly voice that students love. Michael Kardos focuses on technique and presents fiction writing as a teachable (and learnable) art. With an organization built on methods and process rather than traditional literary elements, Kardos helps students begin their stories, write strong scenes, use images and research detail, revise for aesthetics and mechanics, and finish and polish their own stories. Instructors trust The Art and Craft of Fiction to help structure their course, and reinforce and complement their teaching points with examples and exercises. A brief fiction anthology at the back of the book includes 15 selections that instructors praise for their usefulness in the creative writing classroom. 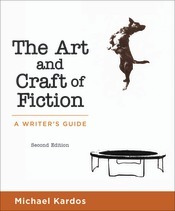 The Art and Craft of Fiction is available in a variety of e-book formats. For more information about our e-book partners, visit macmillanlearning.com/ebooks.